A copy of this book was provided by the author through the Sisterhood of the Traveling Book in exchange for my review. 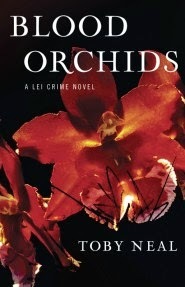 Blood Orchids is the debut thriller from author Toby Neal. The setting is Hawaii, where Lei Texiera is a police officer with the Hilo, Hawaii police force and who happens to be on call when the bodies of two young women are found raped and murdered. As the investigation into the crime continues, Lei is thrown back into her own troubled past. To make matters worse, it appears that she has attracted a stalker. Lei Texiera is the best kind of central character, one that is complex and multi-layered, and throughout the book Toby Neal does an excellent job of putting us inside her head. On the surface, she is a bold, brash, cop who is always in control. Underneath, though is another person altogether. One that has survived a lot, and still bears the scars. This is what really made the book stand out for me. I was fascinated and engaged in learning about what made Lei into the person she was at this point in her life. Even more, I was interested in which road she would take from here. Would she rise above her past, or sink below it and continue to live a life destined to lead to self-destruction. What is even better, is that this question is not answered in just one book, leaving me wanting more and looking forward to the next book in the series. The mystery in the book is well crafted, also. As the story unfolds, Toby Neal presents many possible scenarios for who is behind the rapes and murders and for the who and why of Lei's stalker. Ultimately I learned to suspect everyone, whether they seemed to be on the level or not, and to question whether the stalking was related to the investigation. These questions and the sheer number of theories I could formulate kept me turning the pages. Then, just when I thought the story was over and the questions had been answered, Toby Neal threw in a few more curves that really made the ending to the story stand out. Couple this with the questions regarding where the main characters were headed in the future have me anticipation the rest of the series. This book was a win for me. The mystery was top-notch and fast paced, although it was almost a back story to Lei's for me. Lei's story, however, was compelling with just enough questions answered to satisfy me, but just enough left hanging to make me want to read more. In addition, Toby Neal's depiction of the culture of Hilo was spot on, all the way down to her use of Hawaiian pidgin. I would highly recommend this book to mystery readers, especially if you like exotic locations or strong character back stories.